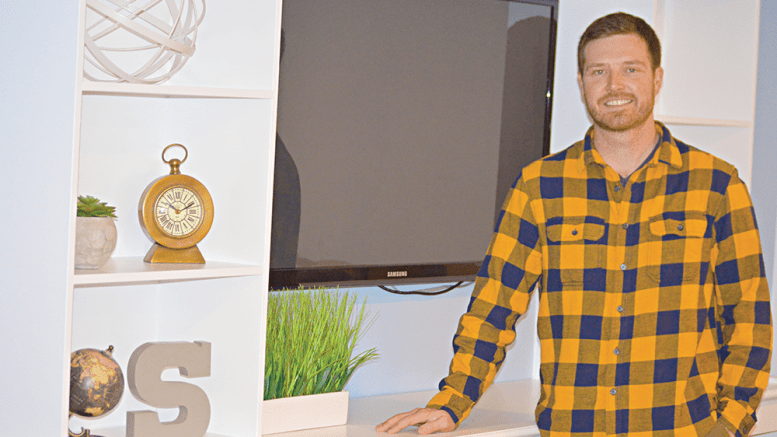 While initially hesitant to announce his home-based business until it showed promise, Charles Stewart is now confident and ready to carve a name for himself in the Niagara Region. While his business, Steworks, began last May, it was a matter of launching a website and finalizing the business and communication details, he said. Since then the response has been “overwhelming,” and he is pleased with the different projects he’s completed to date. His wife, Melissa, a marketing manager at Lookout Ridge Retirement Community, will be assisting him with the promotional and administrative aspects of the operation. As a registered carpenter who has worked with other construction companies and builders, Stewart is experienced in performing many jobs that doesn’t require an entire construction team. Window and door installations and casings, framing a basement, building decks, stairs, as well as remodelling homes, are all on his agenda. The experience was invaluable, as it involves seeing how the carpentry work fits into the project, and how all the other areas of construction relate together. Stewart also worked with his father, and while working with relatives has its challenges, he admits he learned,“You don’t cut corners,” and was taught that perfectionism and quality is what makes the grade. As a project coordinator for a year and a carpenter for seven years at Miller Restoration Niagara, in St. Catharines, Stewart was given the opportunity to develop his analytical skills when it came to budgeting, scheduling and estimating the costs of jobs. “It helped with organizing projects better,” he says, which is a strong asset to have if one is planning on operating their own business. While Stewart concedes that a bigger company could hire or subcontract him to oversee or manage a job, he has always wanted to be his own boss. He enjoys the flexibility of choosing the projects he can do, and consulting with customers on how to improve their ideas. Making helpful suggestions and seeing a project materialize from start to finish is rewarding, he says. Since he attended workshop class at Port Colborne Secondary School, Stewart knew he wanted to be a carpenter. “I always loved working with my hands,” he says, adding it definitely runs in his family. Later on, he pursued a certificate in carpentry at Mohawk College, because he felt the training there was better than any local post-secondary programs. He eventually became licensed. In dealing with customers in the past, he said there are times when people have extravagant plans, but they don’t realize that the costs of certain materials make their idea unaffordable. Stewart says he can offer customers numerous alternative. Constantly attending trade show events, he points out that he is up to date on the newer, modern materials used in construction. For example, there are many more choices of wood siding that are durable and have a wider selection of colours. Some of the windows made in Canada are made from vinyl, but the aluminum versions from Europe are higher quality. He recently learned of an epoxy that comes in a variety of colors that “pops, when it’s buffed out,” which can be used for certain table tops for custom made bars. As far as competition is concerned, Stewart believes there are many carpenters and companies that have their “niches,” meaning they only concentrate on one or two types of jobs, where he can work in many different areas. He says he is also more reasonably priced and more economical to hire than many big companies in the area. If he is hired to do a big project, Steward says he will hire workers that are capable and dependable. He has contacts for blueprint designers, and can expedite things quickly. Many bigger construction companies have too many contracts running simultaneously, he says, which often means they’re not giving the care and attention that’s needed. After working with Miller Restoration Niagara, who specializes in dealing with water, mold and other types of erosion and damage, Stewart can remedy the situation for less cost than the famed Holmes. At times, his reconstruction “goes overboard,” he notes. Stewart likes the rapport of having a good working relationship with people and customers. As a part of his personalized approach, he plans on being a part of the Home Show in Pelham on April 6 and 7. In the meantime, he is busy with a few projects. He just completed a personal one, which is an entertainment wall unit in his recreation room, which is a haven for his two young daughters to play in. They happily consume a great deal of his free time. Now that his business is up and running, he said his second goal is to build his own dream home from top to bottom. In the meantime, he is willing to work on other people’s dreams and goals.